You'll be £19.99 closer to your next £10.00 credit when you purchase The Daily Telegraph - Book of Imperial and Commonwealth Obituaries. What's this? Order within the next 4 hours, 42 minutes to get your order processed the next working day! 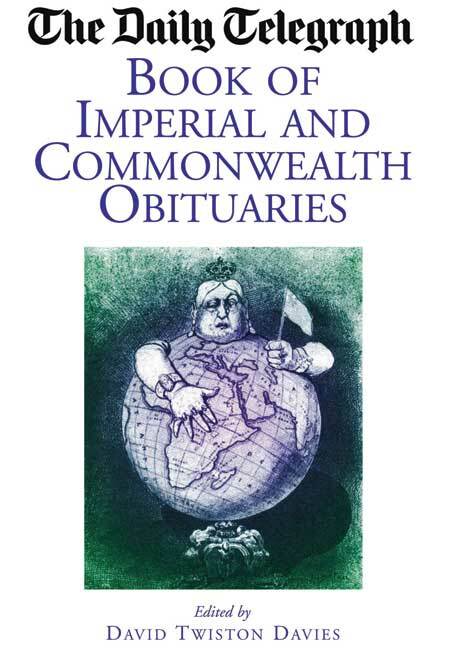 For this new collection, David Twiston-Davies has selected the most fascinating Imperial and Commonwealth obituaries published in The Daily Telegraph over the last twenty years. Many senior representatives of the imperial high noon had passed on by the mid-1980s but there were still some remarkable figures who would have been recognisable to Queen Victoria, such as Sir Rex Niven of Nigeria. There are a host of colourful diplomats such as Sir Michael Weir, the British ambassador in Egypt, who started out as a resident in Arab states and was responsible for escorting a sheikh to the Queen's Coronation in 1953. Other figures featured are Michael Thwaites, the Australian poet, naval officer and Communist spycatcher; Dane Eugenia Charles, the Dominician Prime Minister known as 'The Iron Lady of the Caribbean'; Desmond O'Hagan, the Kenyan district officer who kept a pet elephant and the Earl of Egmont, an Alberta farm boy whose father inherited '300,000 in 1929 and who came over to live in Britain. The stories of these characters beautifully illustrate the way the Imperial influence spread British culture around the world in the form of practices, traditions and history, sometimes positively and deliberately, often unconsciously and sometimes even in the face of considerable hostility. This compilation is divided up by regions, beginning with India, followed by the dominions Canada, Australia, New Zealand, South Africa, and concluding with the individual colonies in Africa and the South Pacific, as well as the North and South Poles. Recounts extraordinary lives and friendships. Often, they are still not forgotten today. Many of the connections were bizarre, but they cannot be deleted. David Twiston Davies could have hardly picked a more interesting collecting. Mr Twiston Davies has the good fortune of having worked with Hugh Massingberd, who is credited with having re-invented the whole concept of the obituary form, earning him the title father of the modern day obituary. Mr Twiston Davies kept this form alive making the obituary pages not only highly readable but, ironically, entertaining. A splendid book - and great reading too. This highy enjoyable and rich compendium never fails to entertain while providing a fascinating insight into the reach, power and lasting cultural influence of an Empire some believed to be greater than Rome. Under the leadership of David Twiston-Davies, the obituaries column of the Daily Telegraph has concentrated on individuals who made their name in the world wars and the British Empire. This collection of obituaries is a wonderful source for both subjects. This is an excellent source book which gives valuable insights into some fascinating characters. David Twiston-Davies is the Chief Obituary Writer of The Daily Telegraph, for which he has worked for almost 40 years. There is no one more suited to have written 'The Daily Telegraph Book of Imperial and Commonwealth Obituaries'. Born in Montreal, he was educated at Downside before taking jobs with the East Anglian Daily Times and the Winnipeg Free Press. Among tasks at the Telegraph, he has edited the Peterborough diary and the letters column when he lived in Royal Tunbridge Wells, home of the legendary letter-writer "Disgusted". As deputy to the late Hugh Massingberd, when the paper did much to make obituaries an important feature throughout the Commonwealth he helped to establish the obituaries column with a set place in the paper every day, concentrating his efforts on the Empire and the two world wars.